Cut butter into small pats and lay out on a cookie sheet lined in wax paper. Stick in the freezer for at least 10 minutes. Prepare cast iron skillet with a tiny amount of bacon grease, if available. Easiest thing: fry one piece of bacon, wipe out the pan, and you’re good to go! Stir the sauce ingredients together (powdered sugar, milk, vanilla), and make sure the powdered sugar is completely dissolved. Combine all the dry ingredients (flour, baking powder, salt, sugar) together and then cut in the cold unsalted butter. Cut in until the butter is about pea sized, relatively well mixed in. Add buttermilk. Add slowly until you have just enough where the dough separates from the sides of the bowl. Stir until just combined and roll it out onto a well-floured surface. Before kneading, prepare a large area for kneading. (I use a large cutting board for easy clean-up!) Sprinkle the area with some flour. Put the dough on the floured area and sprinkle some flour over the dough. Press the dough out (no need to roll with a pin) and flatten to about 1/2″ thickness. Put blueberries over dough. Knead a couple of times and flatten back out to about 1″ thickness. (Honestly, the thicker the better, because they rise so beautifully!) 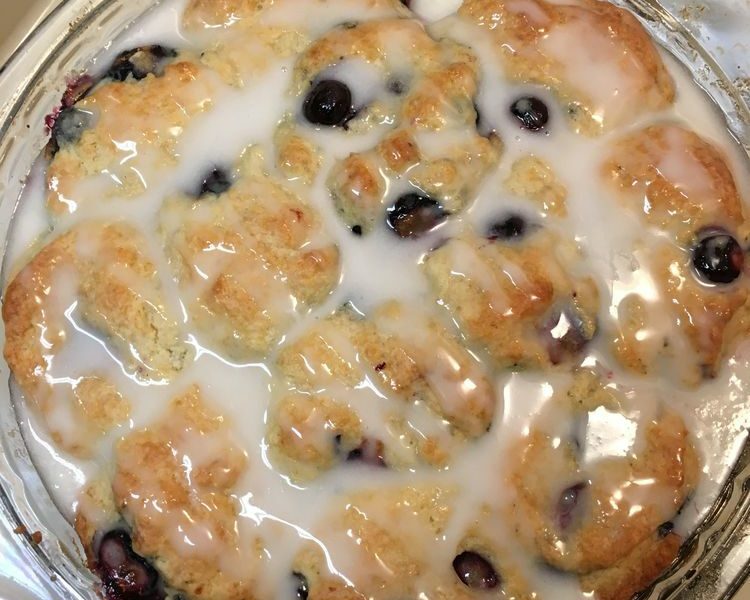 The berries will likely start to bleed onto the dough and you’ll start to see flecks of blue as the berries defrost. Place biscuits in a cast-iron skillet and be sure biscuits are touching. Bake at 500 degrees for about 10-12 minutes. Somewhere around 6 to 8 minutes, take the skillet out of the oven and brush the biscuits with melted salted butter. This is an integral part of the baking process. And be liberal with it, brush on the sides of the biscuits if they are showing. When you begin to see the tops lightly brown (and the blueberries burst), take them out. The temperature in the middle of the biscuits will remain very hot once out of the oven and will continue the cooking process. NOTE: Some people have mentioned that they have to leave their biscuits in for longer than 10 or 12 minutes. I have never had to leave mine in for longer, but if you fear yours aren’t getting done and want to leave them in for longer, be sure to watch them like a hawk! I promise, they will go from done to burnt in just a few seconds! When you take the biscuits out of the oven, let the pan cool for about 10 minutes. Pour the sauce over the biscuits after 10 minutes. Use as much or little of the sauce as desired.